The biennial i Light Marina Bay light art festival in Singapore is Asia’s only sustainable light art festival that showcases an international line-up of creative talent. Located at Singapore’s renowned Marina Bay waterfront promenade, the free event features recycled materials and energy-efficient lighting technologies in the installations to help promote an environmentally responsible lifestyle and sustainable future. 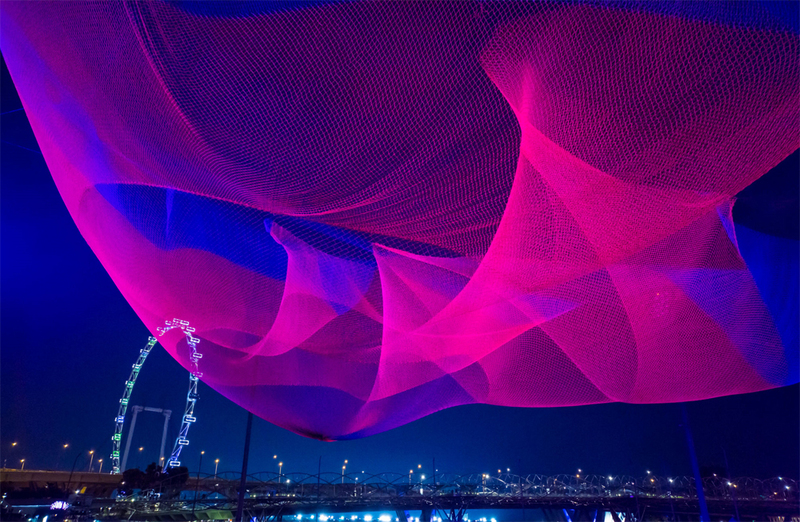 Featured among the many talented contributors, American artist Janet Echelman has teamed with HARMAN’s Martin Professional to bring her “1.26” sculpture to life with Martin’s Exterior 400™ line of energy-efficient LED light fixtures. Using data documented by NASA and NOAA, Echelman’s work is a colorful three-dimensional silhouette of the tsunami that resulted from the 2010 earthquake in Chile. The piece, inspired by the traditional craft of fish net weaving and lace making, is on display at The Float @ Marina Bay. Suspended over the floating platform, the sculpture is lit by 32 Martin Exterior 400 LED lighting fixtures with elliptical diffuser sheets to ensure each beam of light is perfectly angled. “Martin’s Exterior 400’s are extremely bright LED lights that consume very little power making them a natural fit with our work for this festival. They easily covered the distance and provided us with beautiful, robust color that truly tied the entire piece together.” explained Echelman. The Exterior 400 is an extremely powerful yet energy-efficient LED that provides bright light and uniform color washes at great distances. By mixing red, green, blue and white LED’s the Exterior 400™ produces a broad color spectrum that can be calibrated to ensure consistent color across all fixtures in a design. The luminaire also features a rugged IP65 housing that prevents the ingress of dust and water. Additionally, Martin’s M-PC™ lighting controller software was utilized to program each of the 32 Exterior 400 light fixtures within Echelman’s design.